Gutters are costly, but necessary parts of your home’s exterior. Without a good gutter system, water damage can easily afflict your house, foundation, and yard. 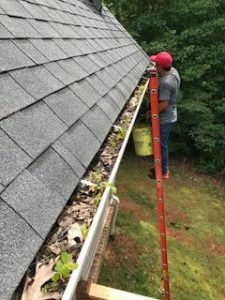 If you want to help make sure your gutter systems last as long as possible, there are a few practices you can do to keep them in good shape. Gutter cleaner, a debris guard system, and simple repairs will do wonders to encourage a full lifespan. You need to do the suggested maintenance on your gutters. In some environments, you’ll want to clean gutters out at least 4 times per year. This includes homes with multiple trees or large shrubs nearby, as well as homes in excessively dusty areas like deserts. The minimum number of times you should be cleaning your gutters out yearly is twice. As a general guideline, it’s best to clean them out before their most necessary seasons. Spring is a common time for heavy rainfall, so you’ll want your gutters in tip-top shape. Autumn brings a lot more leaves and plants particles into the air in many locations, so you may want to clean during late autumn as well. One thing that can ruin gutters more quickly is debris clogging up the waterway and stopping them from functioning properly. Gutters are meant for water movement, not for heavy debris or dirt. This is where gutter guards and gutter covers can help. A set of the right gutters guards will keep all the big stuff out of your gutters and help preserve them for longer. You’ll still need to clean out your gutters regularly, especially to remove the layer of silt that can build up at the bottom. While you’re gutter cleaning, check for any small damage or leaks. It’s a good idea to get this trouble spots patched up before they can ruin your gutters permanently. A small leaks or slight disfiguration is easy enough to repair at home. It’s much easier to fix the issues while they’re still small than to try to correct a huge break, split, crack, or leaks later on. Clogs are one of the worst things for healthy gutter systems. They cause debris to sit against the gutters for too long, resulting in more damage and degradation over a shorter time. Sometimes a stick or some other hard debris may get wedged into the gutters wrong and will cause other debris to catch on it instead of being swept into the downspouts. The biggest problem with this is that large clogs will block water from leaving the gutters as well. Water that’s sitting trapped inside the gutters will do more damage than debris, as the water slowly brings rust, bugs, small animals, and other nuisances around to your home. 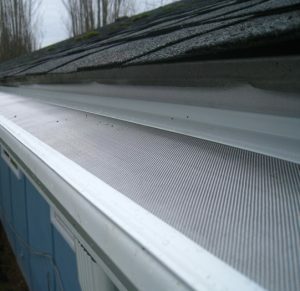 These 4 practical steps can help you keep your gutters in great working order for a long time. These aren’t things you’ll have to think about daily, but just keep them in the back of your mind a few times per year and after large weather events. Previous: Previous post: Gutter Hooks: What Do They Do?